In Genesis 3:14, God’s curse on the serpent included that it would ‘eat dust’ all its life. Many snakes literally do ‘eat dust’. Their darting, forked tongue licks the ground, picking up dust particles which are then carried into the mouth to be sampled by special receptor organs. In this way, they can follow scent trails. Snakes! The mere word strikes horror into the hearts of many. If you happen to be one of these individuals, you may be ophiophobic. True, there are dangerous members of this animal group. Who hasn’t heard of the deadly cobra, the taipan or the venomous rattlesnake? With these, a healthy respect is in order! But have you ever examined these creatures in a different light? Have you ever seen them in the light of their Creator? Take, for example, the eastern hognose snake (Heterodon platyrhinos). This reptile inhabits the upland hillsides, cultivated fields and woodland meadows of the eastern United States. Depending upon the community you are from, it is known as the puff adder, spreading adder or blow viper. The hognose is stout of body with a wide neck and a vicious-looking upturned nose! They are about one metre (39 inches) long when fully grown. What really distinguishes the eastern hognose from its notorious cousins, are its wonderfully designed survival tools. Let’s say you’re enjoying a peaceful afternoon stroll in your favourite wooded meadow. Suddenly and without warning, there is a lot of commotion. You look down and notice, with horror, a one metre cobra! The hood is spread, its body is coiled and it is hissing loudly as it strikes your leg. Upon regaining consciousness (assuming you passed out in fright), a sickening feeling overwhelms you, as you become painfully aware that you are lying on your attacker! However, it seems dead—the snake is lying on its back, tongue hanging out of its mouth. You roll it over with a stick but it rolls back, repeatedly. After determining that gravity is not the culprit, you become aware that this guy is pulling a fast one. This snake pretends to be the most dangerous animal in the forest by impersonating a cobra but if that doesn’t work, it will play dead! Unfortunately for the snake, it doesn’t take a rocket scientist to notice that this act will not earn it an Academy Award. Fearful people often take this opportunity to kill the snake while it is in this state. This is unfortunate, because the eastern hognose snake is quite harmless. 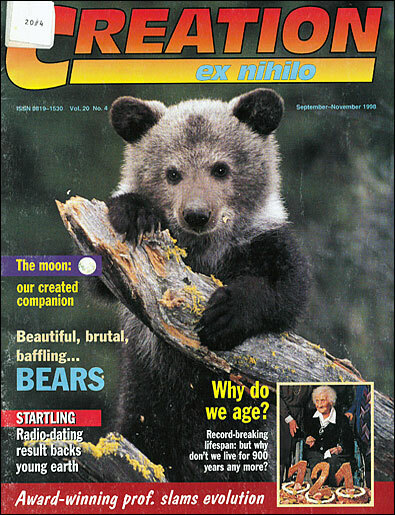 This is why it brings these other strategies to bear, in order to increase its chances for survival. Think of the complicated mechanisms within the snake that allow it to do such feats! What is the origin of these mechanisms (see box below)? Is it time, chance and selection, or deliberate design? This snake’s unusual nose has a purpose. Toads, its main food source, are known to dig into the ground, so the snake’s nose makes a wonderful shovel. When the snake senses that the toad is near, it merely digs up the little amphibian and dines accordingly. But that isn’t all. You see, the toad has this nasty habit of inflating itself, which discourages many would-be predators. The hognose is not discouraged in the least! It is designed so that the back of its mouth contains sharp, backward curving teeth that puncture and deflate the toad, preventing its escape. 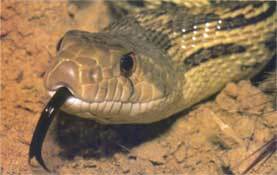 Many people often ask how hognoses (and other snakes) are able to swallow their prey whole, without choking. The Creator has engineered their mouths so they can dislocate their lower jaw. He has also designed an elastic muscle connecting both sides of the mouth. In this way, the snake is actually able to swallow things larger than its head. But if our jaws were wired in the same way, we’d still choke. The solution is the placement of the windpipe. Ours is located in the back of the throat. Theirs is located on the floor of the mouth. I have personally witnessed a Burmese python extend its breathing tube out the side of its mouth while swallowing a huge portion, so it could continue breathing all the time! 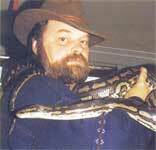 Evolutionists need to explain how the snake could avoid choking before all these features were fully formed. ‘It is a good thing to give thanks unto the Lord and to sing praises unto thy name, O most High … For thou, Lord, hast made me glad through thy work: I will triumph in the works of thy hands. O Lord, how great are thy works!’ (Psalm 92:1, 4–5). Ophiophobia describes an excessive, irrational fear of snakes. Though venomous snakes should be wisely avoided, not all snakes have poison, and some can be safely handled, as creation singer/dinosaur sculptor Buddy Davis finds out. How did harmful things come about? The snake described in this article is obviously harmless to people—but it has mechanisms enabling it to survive in a harsh, fallen world. In fact, virtually all creatures have well designed ‘fight or flight’ mechanisms enabling them to survive in a fallen world of predation, disease, etc. So how and when did these arise—or indeed the poison-injecting fangs of the hognose’s more dangerous cousins? The structures in question (e.g. poison glands) were not there to begin with, but the design information required was added by God after the Fall.Genesis 3) involved changes in living things other than people. Thorns and thistles would now appear, for one thing. We don’t know what the original design of snakes was, but they were re-designed at that time to thenceforth crawl along the ground. Remember that the Curse which came upon creation because of sin. The structures were used for something else, but turned to other purposes after the Fall. This is conceivable for some, like sharp teeth (useful for hard fruit and bamboo), but less so for others. (i) Design demands a Designer—even where the structures are suited to a fallen world. (ii) We can confidently say that no snake would have been poisoning people (or other nephesh animals) before the Fall of Adam. For a more detailed discussion, see the relevant chapter in The Answers Book, available from the addresses p. 2. A fascinating discussion of poisons in general can be found in our Journal of Creation 11(3):353–360, 1997. John Behler and Wayne King, The Audubon Society Field Guide to North American Reptiles and Amphibians, Alfred A. Knopf Inc. New York, 1979. Lawrence E. Palmer, Field Book of Natural History, McGraw Hill Co. New York, 1949.